Since we purchased our home prior to our wedding in 2004, it has been a total work in progress. We bought a house that the 1980’s had deemed their headquarters (complete with a top to bottom Pepto pink bathroom), and scrounged to make it livable. Our newlywed budget and complete lack of design skills are now catching up to us. Several of the rooms that we simply painted and “put a band-aid over” have been our focus over the past 2 years. We’ve completed our bedroom, our kitchen, our guest bath, and our daughter’s room. Only a few big projects left- and the one we have decided to tackle the most recently is our master bathroom. When we bought the house, the tub, shower, and sinks were a light blue color. There was flower wallpaper all over the room that we were unable to get down. A neat trick that we learned from a design specialist is if you have wallpaper that is absolutely STUCK, paint over it with oil-based primer, and then paint it the desited color. We did that and painted the bathroom white, which was a color that coordinated with all of our blue accessories very well. And even now, the color is really not the problem- it’s the mini pool in our bathroom corner. 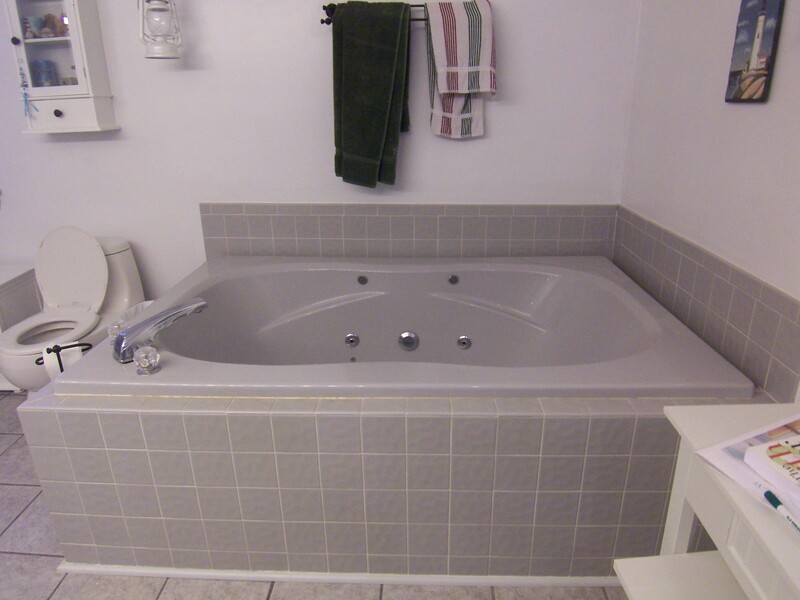 The bathtub is so large that it takes 20 minutes to fill up, it’s impossible to clean, and if you don’t use it on a regular basis, the jets get clogged with black flakes. I’m ready for something different- something actually usable. So, while we want to slowly remodel and modernize the bathroom as a whole, we decided to begin with the tub. 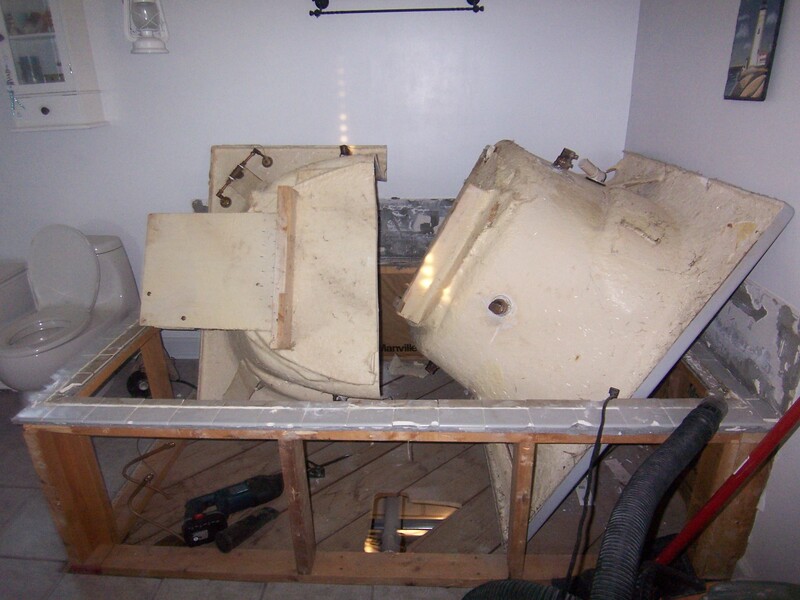 Initially I was set on a clawfoot or freestanding tub. I’ve always been fascinated with how they look in bathrooms- very elegant, classy. And then we found out the price, which was neither elegant nor classy. The faucets that accompany free-standing tubs are also more expensive. But, luckily, the tub that we wanted also came in a “drop-in” version (I hope you are impressed with my plumbing terminology right now), which is the same tub but it has to be surrounded by tile or a surround kit. It’s not designed to be freestanding on it’s own without some sort of “covering”. This week was demolition and ordering week. 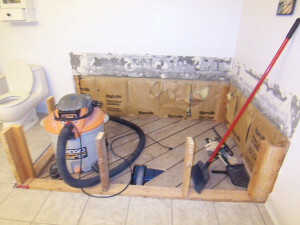 Jason, my hubby, took out the old tub and the surrounding tile. Then we got to pick out the new tub, faucet, and new tile. We decided on a drop-in Jason brand tub (as if the name wasn’t enough of a sign) and a Delta faucet. Now is waiting and anticipating time. Waiting for the new items to come in so we can begin on the work, and anticipating how it will look when we are finished. We just have to make sure our little one steers clear of the hole in the floor in the meantime….